I knew it was something that I had to do. But, somehow walking into Samy’s Camera that day felt a little bit strange. It wasn’t going to be about Canon L Series lenses, or Mark II’s or even 16 GB cards. Today was going to be about convenience…I’m talking about pull-it-out-of-your-diaper-bag and shoot from your hip type of convenience. I don’t know if it’s just me or if I have some sort of photography disorder, but point and shoot cameras frighten me. Maybe it’s that dreaded photo that I’ve taken a hundred times for the over-zealous tourist while family and friends lovingly chant, “Let her take it – she’s a photographer!” When they hand over their cute little digital camera it might as well be some sort of Japanese torture devise. I can usually get the faces somewhere in the frame…but other than that I just point, shoot and pray to the photo gods. I feel so helpless and unable to control this tiny camera. Well, I’m tired of being bullied. Things are going to change. As I stood at the camera counter, I stared blankly at the over-packed shelves, a home to what seemed like hundreds of point and shoot cameras looking for a family to love them. I looked down at my rounding belly and gave it a rub. I came to the realization at that moment that I was going to be THAT mom. I was going to be that mom who tries to document every smile, weird facial expression, scream, whine and giggle. Or at least I wanted to try. And if it wasn’t with my professional SLR, it was going to be with one of those tiny point and shoot cameras. I wasn’t going to let them intimidate me anymore. I am a professional photographer for goodness sakes, but more importantly – I’m a mom on a mission. Doesn’t that just sound like a deadly combination? I thought I’d share some of the things that I looked for when purchasing my point and shoot camera. There are many wonderful options out there, so I’m not saying mine is the only one, obviously! But, these are things you might want to think about when finding the point and shoot that is perfect for you and your family. 1. Size & Compactibility. I wanted something small and compact that I could throw in my diaper bag or purse. 2. Leica Zoom Lens (25 mm-300mm) – A lot of people don’t know this, but one of the things that affects picture quality the most is the lens – and Leica makes some of the best lenses. And it’s a 8x optical zoom to boot! 5. Quick Auto Focus – a must! 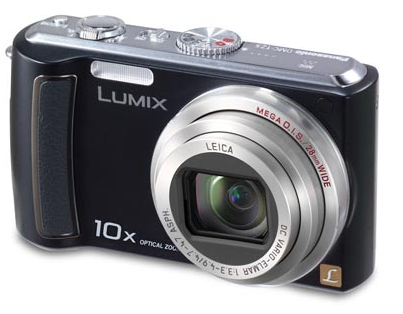 So to sum it all up – it’s a lot of camera for a good price, in a nice little compact body. What more could a mama ask for? It was absolutely perfect for me. Now, it will be fun to see if I can manipulate it to do what I want it to do! It’s going to be a fun journey as I conquer my fear of the “point and shoot” and hopefully get some awesome shots of my little in the process. To see me in action putting this camera to use – check out my free videos by clicking here – CLICK! It seriously happens every time! Oh good! Are you going on a trip to see your little one soon? Hope so! Next post: piper jane turns ONE! !